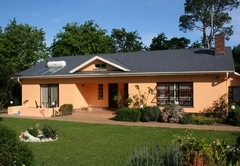 Windermere Quinns Holiday Home is a highly recommended B&B with self catering option, providing accommodation in Somerset West for tourists visiting the Cape Helderberg region. Your German hosts Sylvia and Dieter, like to welcome you to Windermere Quinns Holiday Home. 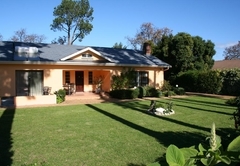 It is situated in a quiet and beautiful area of Somerset West at the foot of the Helderberg Mountain. Cape Town International Airport can be reached by car in approximately 30 minutes and the V&A Waterfront, Table Mountain and the City bowl are 40 minute drive away. In near proximity you also have white beaches, many golf courses and the Winelands with lots of wine farms just around the corner. 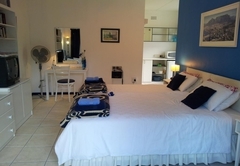 All rooms have direct access to the pool, some rooms are equipped with a kitchen for self catering, as well as a television, fan, hair dryer and your own bathroom. The sunny lounge and breakfast area offers a direct view of the solar heated salt water pool and the spacious garden. 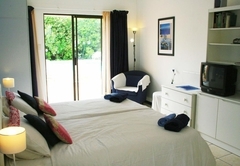 This is a lovely comfortable double room with a king size bed. The bath room has a walk in shower, two basins and a toilet. Other facilities provided are: hair dryer, ceiling fan, heater, television, safe, tea and coffee. The room is west facing with direct access to the pool. 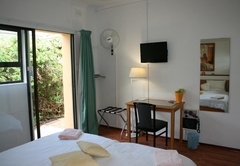 There is a fully equipped kitchenette for self catering and an extra bed can be provided if necessary. Blue View is located in an adjacent building. It’s a lovely sunny double room with two individual beds (double bed) and a functional bathroom with shower, toilet and basin. 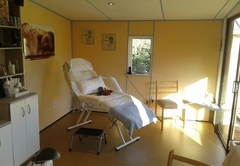 Other facilities provided are a hair dryer, fan, heater, television, safe, tea and coffee. The room has a fully equipped kitchenette with a microwave. 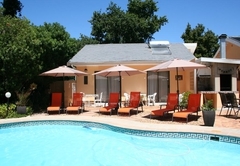 The room is west facing and enjoys direct access to the pool. An extra bed can be provided if necessary. 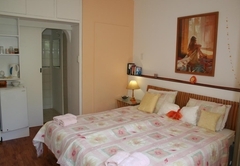 This is a cosy guest room with comfortable king siza bed on the ground floor of the main house. It has a spacious bathroom with a walk in shower, basin and toilet. 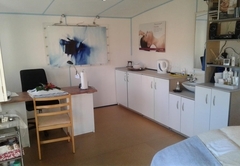 Facilities provided are a hair dryer, fan, heater, television, safe and a electric kettle for either tea or coffee. The room is south facing with direct access to the pool. 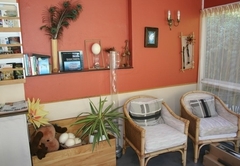 Lovely, cool double room with King size bed in adjacent building. Comfortable bath room with accessible shower 2 basins and toilet. Further: hair dryer, ceiling fan, television, safe, electric kettle for tea or coffee. For self catering is a small kitchen in room. Lovely light and comfortable double room with 2 individual beds in adjacent building. The en suite bath room offer shower toilet and wash basin. Room facilities: hair dryer, television, safe, electric kettle for either tea or coffee. 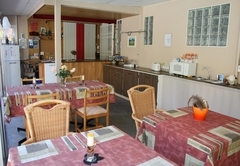 A kitchenette with microwave for light self catering is available in room. 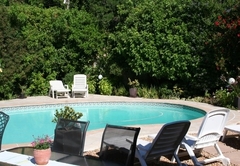 Direct access to pool and garden. Cosy guest room with comfortable King size bed in main house. Comfortable bath room with walk in shower Toilet and basin. Hair dryer, fan, television, safe, electric kettle for either tea or coffee as well as a fridge is available. 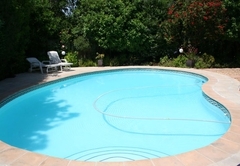 Separate entrance, direct access to pool and garden. This is our new double room with warm brown colours for a very warm welcome. The room offers a king size bed which may be converted into two single beds, built in wardrobes, bath with shower as well as a small kitchen for light self-catering with dishes, fridge and Mini-oven. An undisturbed garden and mountain views from your private patio will spoil you to sit outside to enjoy a glass of wine and beautiful evening or sundowners. Child policyChildren 10 years and older are welcome, unless by prior arrangement.